This is the second of three blogs focused on ingredients, technical sessions and themes that dairy foods formulators should focus on at IFT15--Where Science Feeds Innovation. This annual meeting of the Institute of Food Technologists (IFT) takes place in Chicago July 11 to 14. See you there! As we get closer to the show, two formulation trends are emerging as key themes. 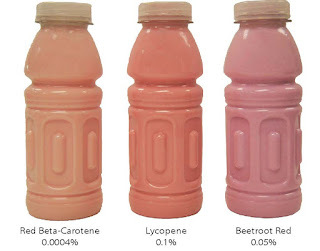 The first being solutions to replace artificial colors with colors from natural sources. The other being egg replacers to deal with the current shortage of real eggs, a shortage that will impact egg-containing formulations including dairy products such as custard, eggnog and French vanilla ice cream for at least two years. Two out of three consumers (67%) favor groceries with fewer and simpler ingredients, while roughly the same percentage take nutritional content statements, ingredient-free statements and statements about health benefits into consideration when buying packaged foods and beverages. These consumers are becoming more vocal—through social media, focus groups, consumer surveys and even petitions—about what they want and do not want in their foods and beverages. As consumers begin to look more closely at what goes into their food and beverages, the industry is reformulating and repositioning mainstream products and lines to have cleaner labels. For example, just this week, General Mills announced its commitment to removing artificial flavors and colors from artificial sources from all of its cereals in response to consumers’ changing preferences. Today, more than 60% of General Mills cereals are already without artificial flavors and colors from artificial sources and have been that way for a long time. 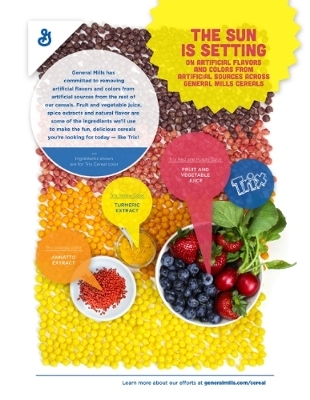 According to a survey conducted by Nielsen on behalf of General Mills, 49% of households are making an effort to avoid artificial flavors and colors from artificial sources. To respond to this growing need, General Mills cereals will be using more recognizable, familiar ingredients to create its colors. 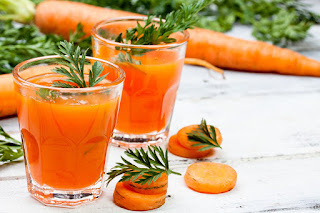 This includes ingredients such as fruit and vegetable juices and spice extracts such as turmeric and annatto to achieve the fun red, yellow, orange and purple colors. Similar efforts are taking place in the dairy foods sector. To read about various options, link HERE. There are more naturally sourced red colors available. (See visual.) 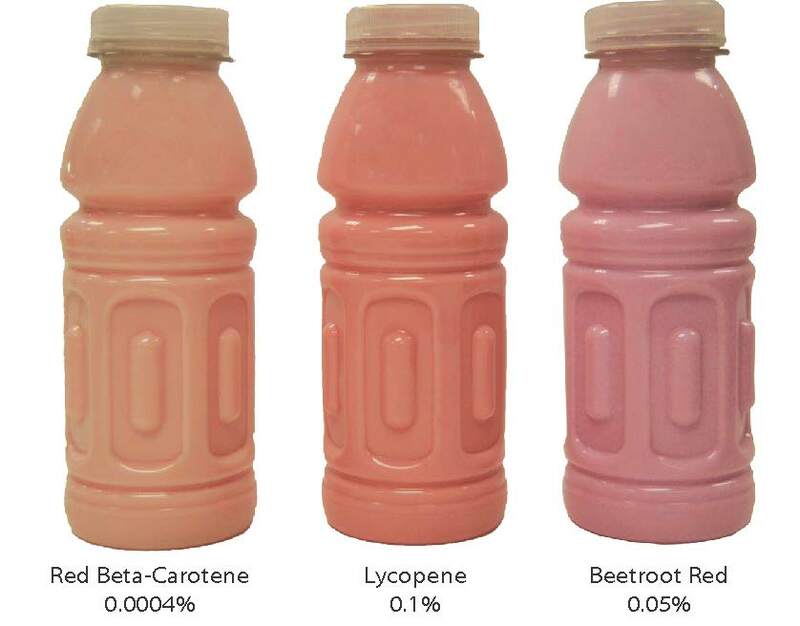 For more information on replacing carmine in dairy beverages, link HERE. For more information on coloring cheese products with carotenoids, link HERE. Kick off this year’s IFT by attending two sessions on colors on Sunday morning. Early risers will want to attend a primer session focusing on the science behind the safe use of colors. Speakers will provide information on the strong safety record of food colors, both synthetic and natural. They will also explore the current challenges impacting the use of these colors internationally, both by regulatory bodies and due to a misinformed public. Immediately following is a symposium regarding establishing standards on naturally sourced colors. From a quality and safety perspective, the certification process for FD&C lakes and dyes (artificial colors) includes a high level of quality control and safety evaluation for certification. However, for “natural sources” there is a general lack of product definitions or publicly available purity, quality and safety specifications that are consistently applied. The risk of adulteration and contamination across the field of natural products ranges from plant sourcing and product labeling to product claims. To address the pressing needs for consistent standards for generation and application of colors from natural sources, a panel with expertise in plant biology, food chemistry, food toxicology, food product development and manufacturing, as well as food quality and regulatory affairs will convene at IFT. They will discuss and describe the use of natural colors in the food industry and discuss quality attributes and safety hazards affecting sourcing and use of natural colorants. Pictured: Dreyer's Strawberry Shortcake Frozen Custard is naturally colored with beet juice. It gets its extra thick and creamy richness from egg. Moving onto eggs, in case you have not heard, there’s an egg shortage in the U.S. due to avian influenza, also known as bird flu. The only way to eradicate bird flu is to destroy the infected flocks. No hens means no eggs. As in any scenario of when demand exceeds supply, price goes up. In efforts to explain the increase in cost of shell eggs and liquid egg products to shoppers, grocers around the country are posting notices about the egg shortage. Food manufacturers using egg ingredients don’t have this luxury. For them, it’s also not just economics. It’s availability. They need eggs to make their products and eggs are just not available. Many food manufacturers are turning to the varied egg replacement ingredients suppliers offer that are designed to replace anywhere from 25% to 100% of eggs in products ranging from baked goods to dressings to meatballs…and of course, dairy foods. Replacement is not as easy as it sounds because of the more than 20 different functions eggs possess. Further, the standards of identity for a number of products that use eggs, most notably frozen custard and eggnog, require minimum amounts of egg ingredient. If those requirements are not met, the product name must be changed. Lots to think about while you attend this year’s IFT. Hope to see you there. This is the first of three blogs focused on ingredients, technical sessions and themes that dairy foods formulators should focus on at IFT15--Where Science Feeds Innovation. This annual meeting of the Institute of Food Technologists (IFT) takes place in Chicago July 11 to 14. See you there! Here are some sessions taking place at IFT that should interest anyone involved with the future of the dairy foods industry. Futurist and Author Mike Walsh will speak on Monday, July 13, from 8:30am to 10:00am. He will share emerging trends and technologies, as well as shifts in consumer behavior, and how these disruptive changes are likely to impact the food industry. For a sneak peak, link HERE. Breakfast foods are trending with consumers. You can expect for IFT exhibitors to be showcasing their ingredients in all types of breakfast applications. Dairy foods will be part of the menu. Here are five technical sessions that address fiber and protein, key components of the most important meal of the day. According to Laurie Demeritt, CEO, The Hartman Group, almost every sector of the food and beverage industry is intently focused on “the breakfast occasion.” And for good reason, as ongoing tracking of food and beverage occasions by The Hartman Group shows that almost a third (32%) of eating and drinking events occur in the morning. For more information on The Hartman Group Eating Occasions Compass, link HERE. Dairy needs to be part of that breakfast menu, which is recognized by a number of food manufacturers. Surprisingly, dairy processors are slow to hop on board. This is a HUGE opportunity. 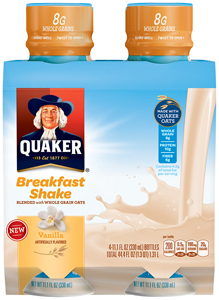 The Quaker Oats Co., a subsidiary of PepsiCo Inc., was first to recognize the dairy-breakfast connection and at the end of 2013 introduced the shelf-stable Quaker Breakfast Shake. Each 11.1-fluid-ounce bottle contains 8 grams of whole grain oats, 10 grams of protein, 6 grams of fiber and 200 calories. 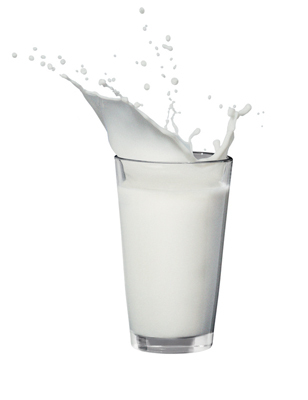 The protein comes primarily from milk protein isolate. The fiber comes from a combination of whole oat flour, polydextrose and hydrocolloids. Calories are kept low through the use of the high-intensity sweetener sucralose in combination with sugar. To read more about this product, link HERE. The company continues to lead with innovation in the breakfast segment. 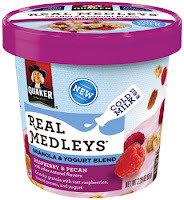 At the recent FMI Connect, the company debuted Quaker Real Medleys Granola & Yogurt Blends. The product elevates the breakfast eating experience through a shelf-stable convergence of crunchy granola, real fruits and nuts, and creamy yogurt. Each 2.29-ounce single-serve cup contains dried nonfat yogurt, which becomes creamy yogurt when a half-cup of cold milk is stirred in and the product sits for two minutes. When made according to direction, a serving contains 25 grams of whole grains, 10 grams of protein and 4 grams of fiber, all for under 300 calories. In addition to the dried yogurt, whey and whey protein concentrate contribute to the protein content. There are three varieties: Apple Cinnamon, Raspberry Pecan and Strawberry & Almond. 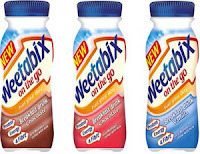 Nestle Health Science wants a piece of the grab-and-go breakfast market. 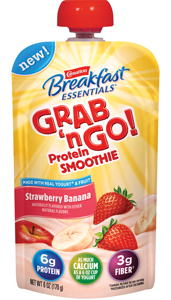 Earlier this week, the Daily Dose of Dairy featured its new Carnation Breakfast Essentials Grab ‘n Go! 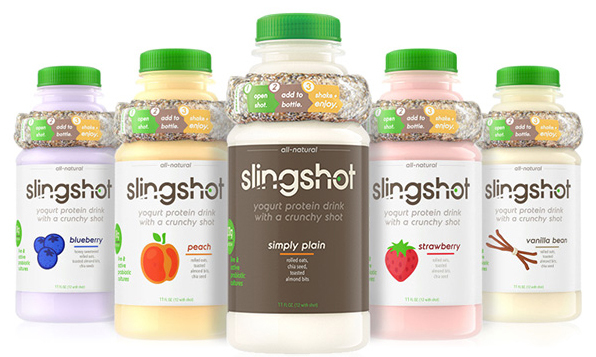 This shelf-stable pouch product targeted to adults combines yogurt and fruit. Each 6-ounce pouch contains 190 calories, 4 grams of fat, 6 grams of protein and 3 grams of fiber. The fiber comes from fructooligosaccharides and inulin sourced from chicory. The protein comes from the cultured milk as well as added whey protein concentrate. To read more about this product, link HERE. To read more about the potential of the pouch package for dairy, link HERE. Along with the pouch rollout comes Carnation Breakfast Essentials High Protein Complete Nutritional Drink. 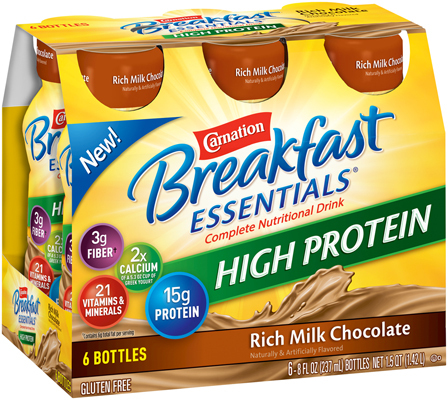 This is basically a higher-protein-with-fiber version of its original Carnation Breakfast Essentials Complete Nutritional Drink. The new offering contains 15 grams of protein per 8-ounce bottle, compared to 10 grams in the original. The high-protein version also contains 220 calories, 6 grams of fat, 12 grams of sugar and 3 grams of fiber. The fiber comes from fructooligosaccharides and inulin sourced from chicory. The protein comes from milk protein concentrate and soy protein isolate. Sugar content is kept low through the use of stevia. 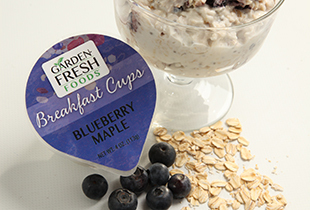 At the recent International Dairy-Deli-Bakery Association, Garden Fresh Foods introduced Breakfast Cups. These 4-ounce single-serve refrigerated cups combine Greek yogurt with fruit, oats and flax seeds. There are four varieties: Apple Cinnamon, Blueberry Maple, Mango Almond and Strawberry Vanilla and Apple Cinnamon. Earlier this week, the Daily Dose of Dairy featured new Yoplait Plenti, which is a combination of Greek yogurt with fruits (except the vanilla variant), whole grain oats, flax and pumpkin seeds. Each serving provides 140 to 150 calories and 1.5 to 2 grams of fat, depending on variety, as well as 1 gram of fiber, 12 grams of sugar and 12 grams of protein. The protein comes from the cultured nonfat milk and the grains and seeds. The fat and fiber come from the grains and seeds. To read more about this product, link HERE. Chobani was the first to combine Greek yogurt, fruit and oats when the company introduced Greek Yogurt Oats this past fall. To read more about this product, link HERE. Others soon followed. Zen Monkey combines apple juice-infused rolled oats, diced fruit and Greek yogurt in a pre-mixed, ready-to-eat cup. 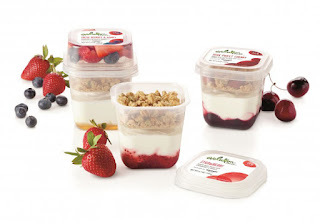 Each container carries the tagline of “breakfast solved.” Each 5.3-ounce cup contains 180 to 190 calories, 1.5 to 2.5 grams of fat, 12 to 15 grams of sugar and 2 to 3 grams of fiber, depending on variety. Each serving also provides 9 grams of protein. To read more about this product, link HERE. 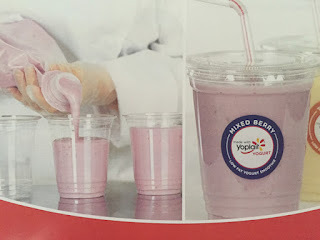 Yoatz combines Greek yogurt, whole fruit and oats. Each 5.3-ounce single-serve cup contains no fat, 11 grams of protein, 4 grams of fiber and a mere 6 grams of sugar. Described as “sugared responsibly,” the Original variety is slightly sweetened with honey and brown sugar. The fruit varieties rely on honey and stevia. To read more about this product, link HERE. Some consumers prefer to drink their breakfast. 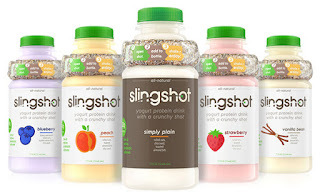 Slingshot is a yogurt protein drink with a crunchy shot wrapped around the bottle neck and intended for the consumer to pour into the yogurt, shake and drink. That shot is a patented plastic stick pouch filled with chia seeds, rolled oats and toasted almond bits. It contributes 3 grams of fiber and 600 milligrams of the omega-3 alpha linolenic acid to the beverage. The beverage is made with low-fat yogurt enhanced with milk protein concentrate and sweetened with agave. A serving contains 295 to 355 calories, 10 to 11 grams of fat and 18 to 20 grams of protein, depending on variety. To read more about this product, link HERE. 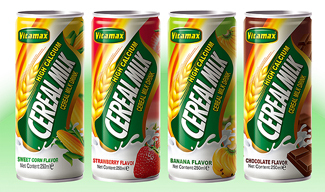 With origins in Asia, Cereal Milk Drink is just what its name implies: a milk-based, cereal-enhanced drink. With a 24-month ambient shelflife, the 250-milliliter cans come in four varieties: Banana, Chocolate, Strawberry and Sweet Corn. To read more about this product, link HERE. 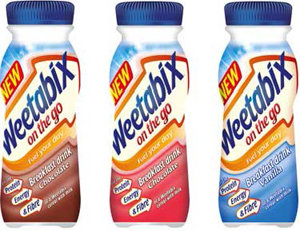 In the U.K., new Weetabix On The Go Breakfast Drink is a smooth, portable milk-based drink designed specifically for breakfast. The primary dairy components of the drinks are skimmed milk (51% to 64%, depending on variety), and milk protein concentrate. They also are enriched with vitamins, minerals and soluble wheat fiber. A serving contains 215 to 226 calories, 6.9 to 8.2 grams of fat, 8.5 to 9.5 grams of protein, 20 to 22 grams of sugar, depending on variety, as well as 5.8 grams of fiber. To read more about this product, link HERE. 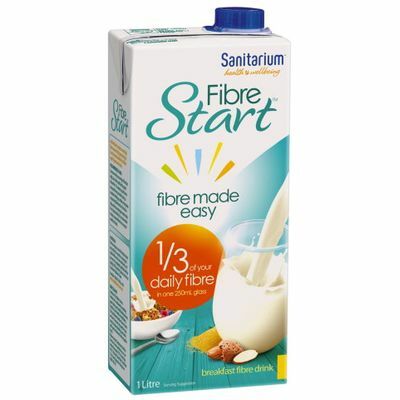 In Australia, Sanitarium Health & Wellbeing markets FibreStart, which combines filtered water with skim milk powder, milk protein concentrate, almonds and three plant fibers (soybean, corn dextrin and inulin). A 250-milliliter serving contains 150 calories, 4 grams of fat, 5 grams of protein and 10 grams of fiber, including soluble and insoluble forms. To read more about this product, link HERE. Hope to see many of you at this year’s IFT! Shall we make breakfast plans? 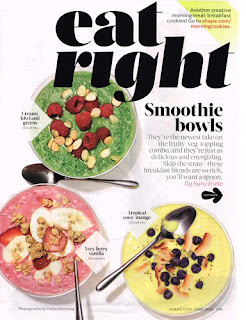 Last week’s blog on smoothie bowls, which can be read HERE, got a lot of folks talking. I was bombarded with questions about the concept and how to best approach it. I don’t have the answers, but what I can do is show you some like products scheduled to enter the marketplace this month. I can also provide insight on how to best label and market such products. Because in between attending the International Dairy-Deli-Bakery Association (IDDBA) conference in Atlanta on Sunday, and FMI Connect and United Fresh in Chicago on Tuesday, I was able to interview Hank Cardello, lead author of the recently published report “How Supermarkets Are Shaping Up and Growing Their Lower-Calorie Products” that has been cited by numerous media outlets this week. Excerpts from the report are located after a sneak peak at a couple of new products rolling out this month. Here’s what Cardello had to say about yogurt. “From years of research we know consumers view foods such as yogurt as healthful,” he says. “When a marketer calls out on the front panel that an already-perceived healthful product has additional healthful attributes, such as lower in calories, no added sugar or enriched with fiber, the consumer response is positive. They don’t fight it. Here’s a sneak peak at a new product from General Mills that will be featured Monday as a Daily Dose of Dairy. (Be patient, you will get the scoop in a couple of days.) Basically Yoplait Plenti is a smoothie bowl. It is nonfat Greek yogurt blended with fruits, whole grains and seeds. 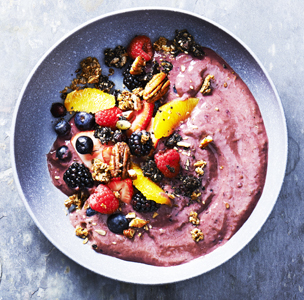 The fruit and granola toppings usually served alongside a smoothie bowl are simply already mixed into the yogurt, creating a smoothie-like consistency. The descriptor “plentiful” says it all. “Sometimes it is best to convey healthfulness through product descriptions or branding,” says Cardello. He cites the examples of lower-fat ice creams described as slow-churned rather than low fat. “Skinny Cow also gets the message across,” he says. I believe Plentiful does as well. Cardello applauds General Mills for its 2005 commitment to improve the nutritional profile of its foods. To date, General Mills has improved the health profile of nearly three-quarters of its U.S. retail sales volume. To read more, link HERE. This was his response to my query about General Mills making a 25% reduction in sugar in its flagship Yoplait Original yogurt line. The reformulated product line—all 25 varieties—just started rolling out a few weeks ago. 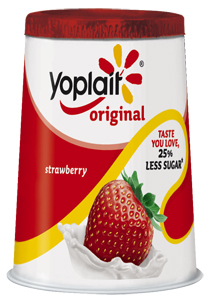 To read more about new Yoplait Original with 25% less sugar, link HERE. Determined to deliver on their brand promise, Yoplait is offering a taste guarantee for Yoplait Original with reduced sugar. Any unsatisfied customer can mail in their Yoplait Original receipt to receive a refund (up to 88 cents). 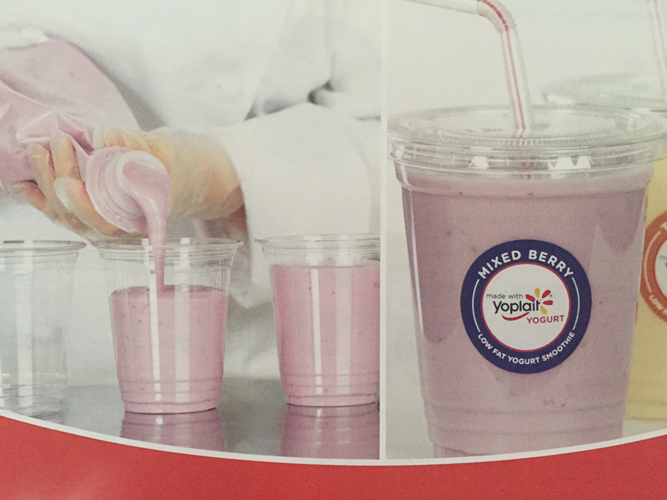 At IDDBA, General Mills’ convenience and foodservice division debuted Yoplait Smoothie Pro. The product resembles the company’s squeezable, recloseable bags of yogurt for making fresh fruit parfaits. Based on the company’s research with experienced and inexperienced smoothie makers, the bags are five-times faster than blender-made smoothies. Simply open and squeeze to portion with ease! Made with cultured low-fat milk, Smoothie Pro comes in two varieties: Mixed Berry and Tropical. Each bag is 60-ounces and they come in cases of six. 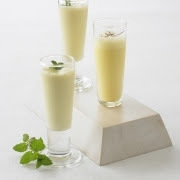 These ready-to-serve smoothies can easily be portioned into a bowl with spoon rather than a cup with straw. Think smoothie bowl self-serve bar. Dannon has been busy in the drawing room as well. This past spring, Evolution Fresh and Dannon teamed up to launch “Evolution Fresh Greek Yogurt Products, Inspired by Dannon.” The platform consists of three product concepts: smoothies, yogurts and yogurt parfaits. 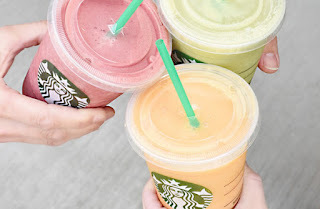 The Evolution Fresh Smoothies have been available for a few months at regional Starbucks stores and select locations within grocery retailers. 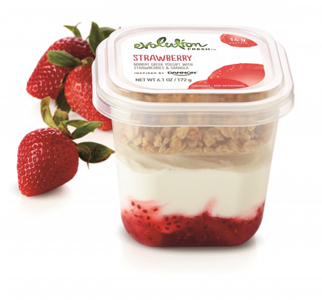 The Greek yogurt parfaits debuted in May at Starbucks stores nationwide. The fruit-on-the-bottom Greek yogurts should be hitting grocery shelves nationwide this month. Each product is made with simple ingredients that highlight the delicious taste of fruits and vegetables and a proprietary Greek nonfat yogurt. Dannon and Evolution Fresh worked together for two years to develop this proprietary Greek nonfat yogurt that is not only creamy, but is the perfect canvas for the high-quality fruit and vegetables used in these unique products, according to the companies. Further, all of these products are made without artificial flavors or sweeteners and no preservatives. The smoothies are made with the Greek yogurt and cold-pressed 100% real fruit and vegetable juice that has been high-pressure processed for food safety. They come in three made-to-order varieties--Mango Carrot, Strawberry and Sweet Greens—and can be customized by adding fresh kale, protein powder or extra Greek yogurt for an extra boost of nutrients or protein. The parfaits are crafted by hand from proprietary, creamy, Greek nonfat yogurt, artisan granola and real fruit. They will be available year-round in Dark Sweet Cherry and Strawberry varieties, and seasonally in Fresh Berries and Honey options. With these two product concepts now implemented, joining the Starbucks’ stores hot oatmeal line, I think smoothie bowls will be on the menu soon. The fruit-on-the-bottom Greek yogurts are what’s happening on the retail front this month. Available in four flavors--Black Cherry, Blueberry, Pineapple Passion Fruit and Raspberry Blackberry—the yogurts comes in clear packaging that consumers can easily see the high-quality craftsmanship and simple ingredients that go into each spoonful. The cups are 5.3-ounces, which has become the standard in the Greek yogurt segment, but the clear packaging and the shape are unique to Evolution. Each container contains 120 calories and has a suggested retail price of $1.69. Cardello presented his research to the retail food industry at a morning educational session on Tuesday at FMI Connect. 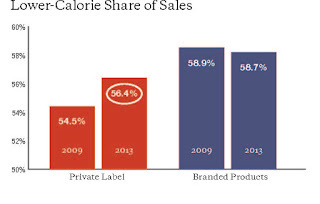 His research showed that lower-calorie foods and beverages drove the bulk of sales growth for supermarket chains between 2009 and 2013, making up 59% of growth, compared to just 41% for their higher-calorie counterparts. 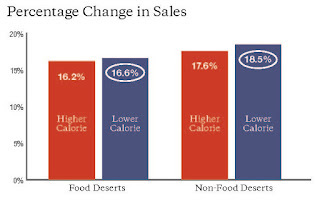 This is the first report to examine the business impact that sales of lower-calorie items have on supermarket chains. Those trend lines did not hold, however, for foods and beverages that contribute the most calories to the diets of children and adolescents, items such as desserts, snacks, sugary drinks and pizzas. During the study period, higher-calorie versions of these products made up more than 70% of sales and grew more than 12%, whereas lower-calorie foods and drinks saw growth of roughly 5%. The overall shift in supermarket sales to lower-calorie products is largely consistent with recent changes in the restaurant and food and beverage industries, the report found—except that sales of lower-calorie items grew at an even faster rate for the latter two sectors, indicating that supermarkets could be taking better advantage of the public’s shift in food preferences. To produce the report published by the Hudson Institute and funded by the Robert Wood Johnson Foundation (RWJF), Cardello and his team analyzed Nielsen Scantrack data from 2009 and 2013 for 202 individual food and beverage categories for the three largest supermarket retailers in the U.S., including their 26 banner chains. The categories include a wide range of foods, such as cereal, pasta, fruits, vegetables, packaged meals, milk and snacks. The researchers used data on the average number of items on a store shelf, and, most important, the total sales in dollars for each category. Together the three retail ownership groups account for 45% of the U.S. supermarket industry. Researchers then classified each product as either lower-calorie or higher-calorie based on criteria developed previously in conjunction with the Nutrition Coordinating Center at the University of Minnesota. For instance, cereals with 150 calories per serving or less, beverages with 50 calories or less, and skim and 1% milk would all qualify as lower-calorie items. Cardello says that chains can grow their sales of lower-calorie items by giving them more prominent shelf placement, highlighting them on in-store ads and displays, and selling more of them in check-out lanes. The new report also compared sales of stores in food deserts—areas with limited access to healthy, affordable foods—to those not in food deserts. 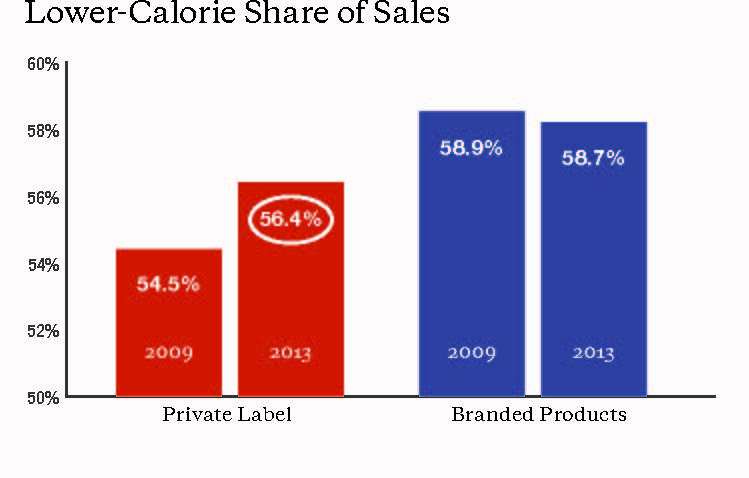 Cardello and colleagues found that lower-calorie sales were growing at a greater rate than higher-calorie sales in both areas. 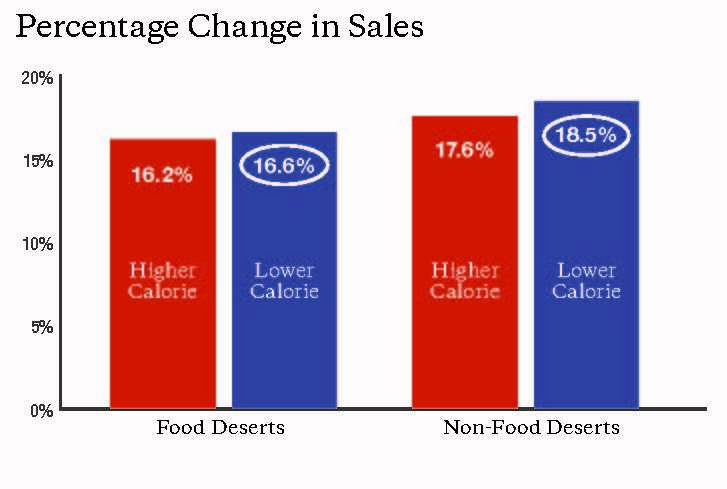 However, the share of total sales in food deserts from lower-calorie items was less than for stores not located in food deserts—enough to equate to $500 million in forgone lower-calorie revenue for stores in food deserts. To access the complete report, link HERE. Smoothie Bowls and Pourable Yogurt: Who Will Be First to Market? A special thanks to the folks at Vitamix who hosted a media luncheon and showed attendees how their power machine assists foodservice operators with creating all types of goodies, from sauces and dressings to soups and smoothies. The company’s Chef and Recipe Development Manager Bev Shaffer introduced me to the smoothie bowl. It got me thinking that this could be something for my dairy industry friends. The smoothie bowl is just what it sounds like. It’s a smoothie in a bowl intended to be consumed with a spoon not a straw. And you add toppings, such as nuts, diced fruit or granola. Sound familiar? Yes, it’s sort of like yogurt, but it’s blended fruit. I think it can be both fruit and dairy. It can be sold in a bowl, ready to eat, or in a pourable format. This week I purchased a number of ready-to-drink refrigerated smoothies. I mixed them with varying portions of Greek yogurt and added extra whey protein. I portioned some into single-serve containers. Others I repackaged into the original smoothie bottle. Over the course of the week I have been enjoying the creations with my family. Here’s what I learned and hope can assist with your product development efforts. Depending on the fruit/veggie smoothie, the best ratio was about 70% to 80% fruit/veggie to 30% to 20% whole milk Greek yogurt. By far, whole milk Greek yogurt tasted much better than lower-fat versions and it also provided a desirable creaminess and visual appeal. I also added a decent amount of whey protein. That’s something you will have to play around with to achieve a target protein content. They were all super yummy, especially with added toppings. To commercialize and obtain a longer shelf life, some clean-label stabilizer might be useful. A boost of fiber, preferably a prebiotic one, makes sense. It’s the complete package. Protein and fiber to fill you up. 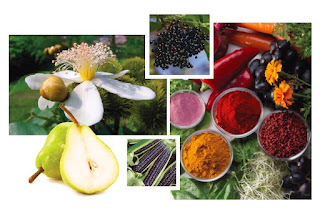 Prebiotics and probiotics for digestive health. And fruits and veggies to comply with the Dietary Guidelines. Who will be first to market with this concept? It can be sold in a bowl-like package, similar to single-serve oatmeal containers, but probably recyclable plastic. Maybe a larger Greek-style yogurt container would work. It can come with a dome or a separate packet of yummy toppings. Don’t forget the spoon in lid. It’s perfect for coffee shops, airport kiosks and convenience stores. It’s more interactive and customizable than a drinkable smoothie. The varied textures provide a sensory adventure. Another option is pourable. It can be sold in the dairy case or in the produce department. Consumers can purchase their own toppings. I sure hope some of you jump on this idea. Cannot wait to see who is first to market! The smoothie bowl complements many of Dairy Council of California’s Spring 2015 Nutrition Trends, as you will learn in the following report. Dairy Council’s trends tracking system identifies food and nutrition issues likely to impact the dairy industry in the next three to five years. Dairy Council staff identifies the trends and then compiles the information in a newsletter twice a year to distribute to industry leaders for their own communication and planning purposes. Here’s the latest issue. 1. Transparency is critical as food landscape becomes increasingly complex. A healthy diet used to mean one that provided all the nutrients and food groups in the correct amounts. Now it encompasses many other factors such as environmental and agricultural considerations. As a result, consumers are increasingly confused over their food choices. Should they choose organic milk? Should GMO-produced foods be avoided? What about hormones, antibiotics and water usage? Advances and innovations in food production and processing are concerns for some people. In general, consumers are more willing to accept new technologies when there is transparency and when they see a benefit—for example, when technologies reduce the amount of pesticides needed, minimize water usage, result in greater production on less land or improve nutrition. To maintain trust and integrity, it will be important for the food industry to continue to practice transparency and communicate with consumers on issues such as where and how food is produced. This can be done through product labels, websites or point-of-purchase print materials. Dairy Council of California helps educate consumers about the benefits of these technologies so that they can make educated decisions about the food they purchase and consume. 2. Public policy advocates for plant-based diets due to environmental concerns. As sustainability becomes a key aspect of food production practices, public policy is on the verge of incorporating environmental measures into dietary recommendations. As an example, the 2015 Dietary Guidelines Advisory Committee (DGAC) included sustainability in its meeting discussions for the first time. Many health agencies are advising plant-based diets not only for health reasons but also out of concern for the environment, citing research that greenhouse gas emissions are higher for animal-based versus plant-based foods. These recommendations often discourage consumption of dairy foods, resulting in an increased demand for alternatives such as almond, rice and coconut beverages. Many organizations also advocate for locally produced, natural and unprocessed foods to reduce environmental footprint. Nutrient density is an important concept to include in discussions of sustainability, as ultimately it is nutrition that sustains consumer health. The dairy industry—and its animal-agriculture counterparts in other areas—must ensure that food choices are based first and foremost on health and nutritional attributes to avoid unintended consequences such as nutrient deficiencies and chronic disease. Dairy Council of California is monitoring this issue closely and advocating for consumer health through messages about nutrient density. 3. Community health is seen as instrumental to disease prevention and management. Significant changes are affecting the structure, staffing and availability of health care. Community clinics are appearing in drug, warehouse and grocery stores for everything from prescription refills to flu shots and are staffed by paraprofessionals. Peer health workers conduct in-home consultations that assess both consumer health and living situations, including community, family, socioeconomic status and other factors that impact health and disease risk. With the increase in incidence of obesity and related diseases such as diabetes and heart disease, health care gatekeepers are focusing on disease prevention and self-management in addition to wellness. Groups that are often remiss in preventative health, such as low-income groups and specific ethnic groups such as Hispanics, may particularly benefit from greater access to health care with a focus on disease prevention. Schools are another venue for health care delivery, with school-based nutrition education and health centers on the rise. It is well-accepted that disease prevention starts in early childhood with healthy diet and lifestyle habits. Therefore, children can benefit from nutrition and health messages, and families are reached through take-home materials. Dairy Council of California is embracing these changes in community health by reaching children and caregivers through widespread connections in schools and by exploring venues through community health workers. 4. Dairy’s list of health benefits grows increasingly diverse but skeptics abound. Research on milk and dairy foods continues to expand beyond calcium and bone health to preventative effects against high blood pressure, metabolic syndrome, Type 2 diabetes, heart disease, sarcopenia and obesity. Milk, chocolate milk and whey protein are also top-of-mind for many athletes for muscle-building, hydration and muscle-recovery benefits. All in all, dairy research—both on whole dairy foods and on their individual nutrients—continues to be very positive for preventing a number of chronic diseases and optimizing lifelong health. Skeptics, however, may question the reliability of research funded by the dairy industry. It is critical to conduct research at credible universities with highly respected scientists and to publish in peer-reviewed journals. Third-party spokespeople can also help disseminate positive dairy messages when the research warrants it. Dairy Council of California engages in credible dairy research and uses researchers, public health experts and credible stakeholders to present at key meetings and conferences. 5. The face of nutrition education is changing. Factors such as improved technology and consumer eating patterns are changing how nutrition education is being delivered. Technology plays a significant role in health and nutrition as consumers become more adept at accessing personalized information from websites and mobile applications. At the same time, the 24/7 availability of snacks and convenience foods is changing the way consumers eat. When they do eat at home, they often “assemble” meals rather than cook from scratch. All of this means that nutrition messages need to be more creative, reaching consumers where they are—whether at the workplace, at school, at the store or elsewhere—with mobile device applications, videos, websites and social media. Successful messages need to be tailored to individuals and be motivational and feasible. 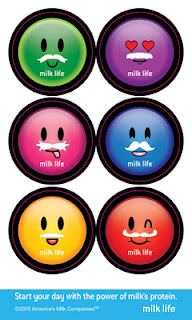 Dairy Council of California programs are based on strategies that promote positive changes in behavior using multiple concise touch points with emotional connections that resonate with today’s consumers. 6. Public health recommendations focus on dietary patterns. With the 2015 Dietary Guidelines for Americans to be released later this year, considerable discussion has centered on healthy dietary patterns. The DGAC draft recommendations for a healthy diet include low-fat or fat-free dairy, vegetables, fruits, whole grains, seafood, legumes and nuts. Reduced consumption of red and processed meat, sugar-sweetened food and beverages and refined grains is also recommended. These dietary patterns include two to three servings of dairy per day. The focus on dietary patterns rather than on specific nutrients is positive for milk and dairy products. For America’s children, milk continues to be the number one source of nine essential nutrients, including three of the four nutrients deemed under-consumed—calcium, vitamin D and potassium. Dairy’s irreplaceable nutrient package continues to position it in the Dietary Guidelines as an important food group. Dairy Council of California provides nutrition education to children and adults focused on all five food groups, with milk as a cornerstone of a healthy diet. 7. Snacking is more prevalent among all demographic groups. Trends show that snacking now provides about one quarter of calories and a substantial proportion of daily fat, sugar and salt intake. Snacks can be an opportunity to fill nutrient gaps from meals that may be lacking in food groups or nutrients. However, consumers tend to indulge rather than consider nutrition when snacking. The message that snacks can taste good and be nutritious is important. Consumers benefit from learning to plan healthy, appealing, convenient snacks throughout the day. Milk and dairy foods are a perfect match for these messages as cheese sticks, single-serve yogurt containers and individual plain and flavored milks are healthy, transportable and tasty snacks at any time of the day. Dairy Council of California is implementing strategies to teach parents and children how to plan and prepare healthy snacks, with a focus on nutrient-dense, convenient and tasty options. 8. Sugar continues to be demonized as the culprit in many diseases. Sugar continues to take the blame for many health ailments from obesity to diabetes. As a result, various strategies seek to lower the sugar content of foods, educate consumers and discourage consumption of products high in added sugar. One example is the taxing of sweetened foods and beverages. The 2015 Dietary Guidelines may follow the World Health Organization’s recommendation that sugar comprise less than 10 percent of calorie intake. The U.S. Food and Drug Administration is proposing changes to Nutrition Facts labels to include a separate line for added sugar, making it easier for consumers to distinguish between natural and added sugar. Much of the sugar in dairy is natural in the form of lactose; however, increased attention on sugar could demonize both added and natural sugar. In addition, flavored milk and sweetened yogurt will need to declare how many grams of added sugar they contain. Consumers and health professionals alike will need to be reminded that some products contain sugar but also provide significant nutrients—in other words, that nutrient density is a better measure of a product’s nutritional contributions. All foods consumed in moderation, even those that contain sweeteners, can be part of a healthy, balanced diet. Dairy Council of California provides education around nutrient density and highlights the difference between natural and added sugar. 9. Research on probiotics and the gut microbiome gains steam in the health arena. Probiotics, known for their benefits to intestinal health and the immune system, are now being investigated for their preventative effects against chronic diseases such as cancer, high blood pressure, obesity and diabetes. Recent studies have even made a connection between probiotics and mental health—an area of interest given our aging population. The microbiome—the collection of trillions of microbes living in the gut—is recognized as playing a role in many basic life processes, greatly impacting health and disease. Scientists believe that the microbiome may be responsible for a broad range of metabolic and developmental processes from food digestion to vitamin synthesis to brain function. However, probiotics and the microbiome are not yet top-of-mind for most consumers. While there was some mention of the topic in recent DGAC discussions, the 2015 dietary recommendations are not expected to address probiotics. Consumers will likely drive the market based on word of mouth, the media and product manufacturers. Dairy Council of California will continue to educate health professionals and consumers on the substantiated effects and good sources of probiotics such as yogurt, kefir and fermented milks and the growing research around the microbiome. 10. Protein continues to carry a health halo. Animal protein from meat and dairy is the highest quality protein. However, a lack of understanding of protein quality has plant sources often lumped together with animal sources. Protein consumption that is evenly distributed throughout the day is thought to provide the most benefit, which means that for many Americans, more protein is needed at breakfast and lunch to even out the daily distribution. Dairy Council of California is informing consumers about the expanded health benefits of protein, quality protein sources and ways to plan diets with evenly distributed protein content. For more information or to receive a hard copy of the TRENDS newsletter, email HERE. For more information on the Dairy Council of California, link HERE.